Thank you Vital Proteins for sponsoring this post so I can share the recipe for this healthy mixed berry collagen crisp! My boyfriend and I signed up to be part of a local farm share this summer and it has been a MOSTLY wonderful experience. I have loved getting so much fresh and local produce every other week and getting to try a bunch of new vegetables I would normally never pick out for myself. My boyfriend is usually the one who picks up our share but last week he was out of town for work and I had to head over to the farm to pick up the produce instead. Most of the veggies are already picked and sorted for you in bins but there are a few options for you to go out onto the farm to pick yourself. Raspberries were on the "you-pick" list last week so I ventured out on the farm to try and get some. Let me tell you something. I was SEVERELY under prepared to go pick raspberries and I have a total new found appreciation for all farm workers everywhere now. I rolled up to the farm right after work at the end of a hot summer day where it had rained all afternoon. My dress pants and shoes were soon completely covered in mud, it was so hot outside that I sweat through my bra before I even found where the dang raspberries were growing on the farm, and I left overall smelling like a big ole cow turd and having multiple VERY close encounters with some bugs and only a little tiny quart of fresh raspberries to show for it. 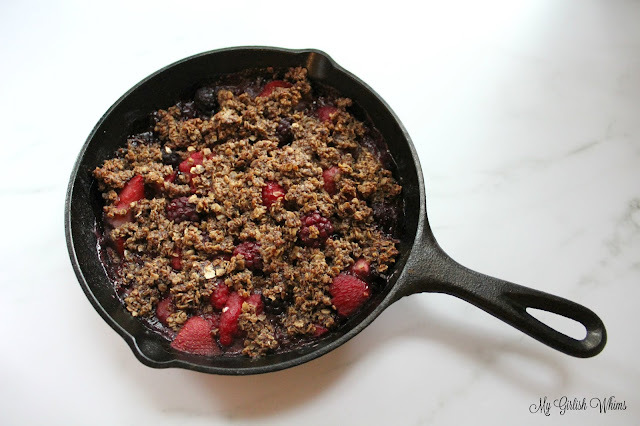 I used three different kinds of berries in the fruit portion of this crisp and then added mixed berry collagen peptides from Vital Proteins to the oat crumble on top to enhance the flavor of the crisp and give it added health benefits! This version of collagen peptides is supplemented with hyaluronic acid which helps to promote healthier hair, skin and nails and probiotics to support better gut health. 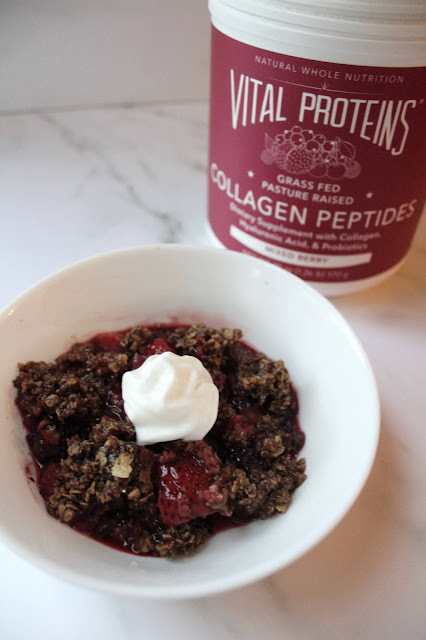 Collagen is well known for increasing bone and joint health and this version of collagen peptides are sourced from grass-fed, pasture-raised bovine hides and organic berries. 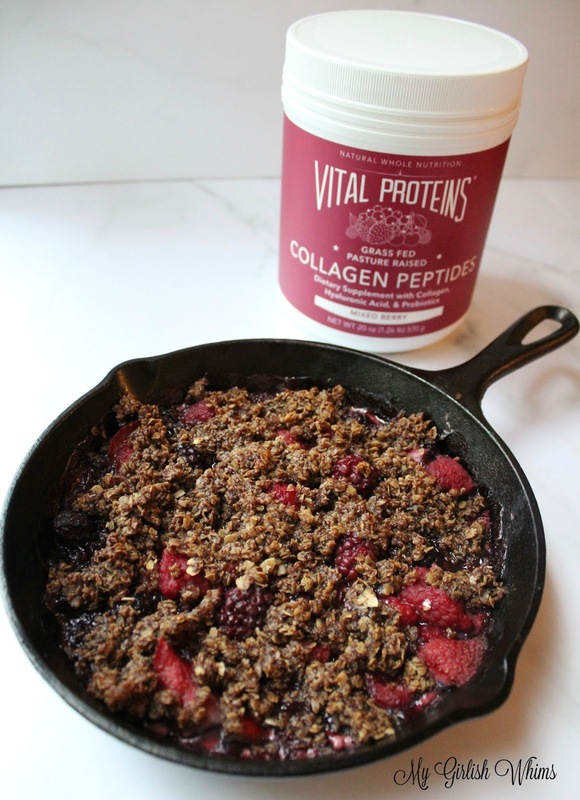 Even if you don't have your own organic raspberries that were literally plucked from in-between wayyyy too much nature than I was comfortable being close to like mine were, you can still know that you are using a really quality collagen supplement ingredient with these peptides from Vital Proteins! As always with my desserts, I try to keep the calories low and add extra protein wherever possible. The recipe for this crisp makes 4 servings for less than 200 calories each with 7 grams of protein per serving. Get the full nutrition facts and recipe below! 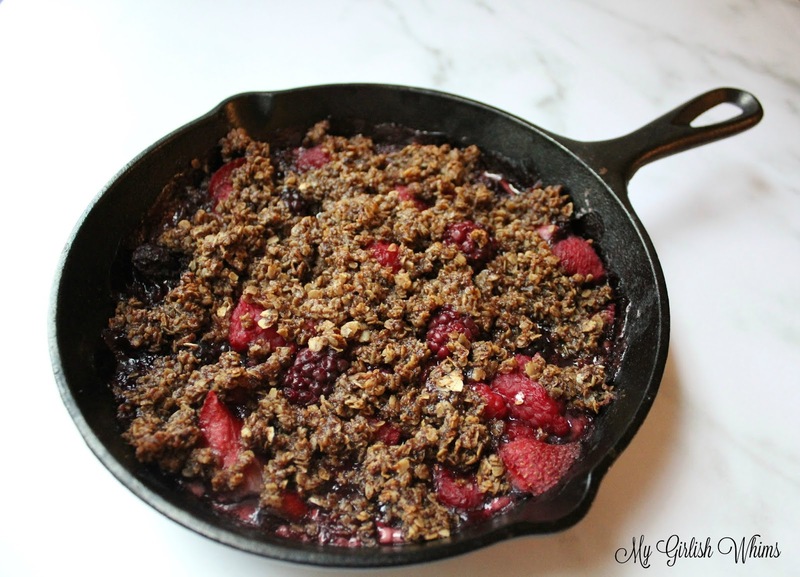 This recipe makes 4 servings for 189 calories each. One serving has 34 grams of carbs, 5 grams of fat, and 7 grams of protein. 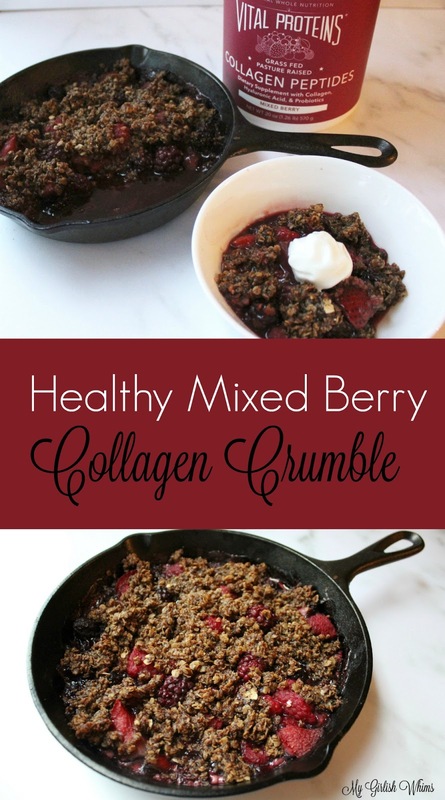 Three different kinds of berries come together for a fresh and healthy dessert crisp supplemented with mixed berry collagen peptides for a flavorful and healthy treat! Preheat oven to 350 degrees FWash and dry berries then combine with stevia in the raw and lemon juice in a bowlMix in arrowroot starch then pour into a 8 inch skilletIn a separate bowl combine all ingredients for the collagen crisp except the butterFold the butter into the oat mixture using a fork until combined and then crumble over the top of the berries in the skillet Bake at 350 degrees for 30 minutes then serve!